If your company is looking for embroidered business shirts that are a bit more sophisticated than your average polo shirt, try our line of personalized dress shirts. The professionalism that comes along with custom embroidered work shirts is contagious. Try our wide assortment of custom embroidered dress shirts which includes oxford, denim, poplin, twill, tailored and camp shirts, etc. in a variety of colors printed or embroidered with your photo, graphic or company name and logo. 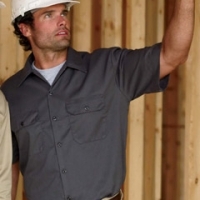 All of our custom embroidered work shirts are not listed online so if you do not see the dress shirt style you are looking for give us a call or email us. More Custom Embroidered Corporate Shirts Coming Soon! More custom embroidered business shirts on the way. Check back with us in a few months to see our new line of custom embroidered dress shirts including the latest oxford, denim, poplin, twill, camp, woven and tailored dress shirts. 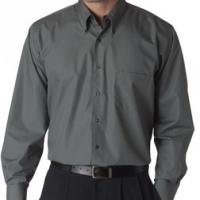 Personalized dress shirts can be in the form of embroidered, screen printed, and/or monogrammed dress shirts.